Once enabled, the effect can be quite interesting, as you can see in this brief movie—note that you’ll need QuickTime7 to see the clip, as it’s encoded with the H.264 codec. That’s a bit of the Beaches screen saver doing its best “Ken Burns effect” zoom while I work in a Finder window in the foreground. To get this own effect on your machine requires that you (a) have a screen saver selected in the Desktop & Screen Saver preferences panel, and (b) that you type one somewhat-lengthy command in the Terminal. First, make sure you’ve got an active screen saver by opening System Preferences, clicking on the Desktop & Screen Saver panel, clicking on the Screen Saver tab, and then choosing any screen saver. This trick works with any screen saver—those provided by Apple, third-party savers, and even the iPhoto screen savers. Once you have a screen saver selected, close System Preferences and switch to the Terminal (in /Applications: Utilities). The above is actually one long line with no additional spaces—the backslash breaks the line for display purposes, so it’s easier to read here. It also means you can still copy and paste the line (both of them) from here into your Terminal. So do that now, or type it out yourself if you’d like to give your fingers a workout. When you hit Return, your chosen screen saver will launch in the background, and you can then go right back to whatever else you were doing. When you tire of the effect, switch back to Terminal and hit Control-C to end the process. A good thing to do once you have the screen saver active is to see how much of your CPU is being used for this bit of magic. 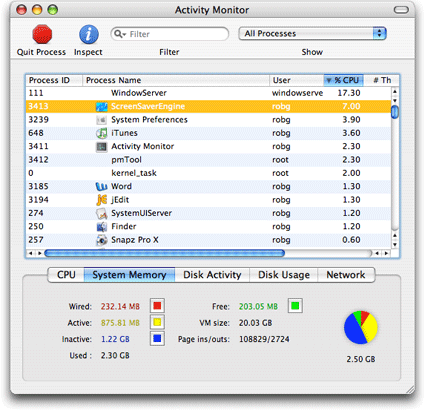 Launch Activity Monitor (in /Applications: Utilities), and click on the %CPU column heading (to sort by CPU usage), and make sure you see a downward-pointing triangle, which may require a second click (this sorts the results from most to least CPU usage). Look for an entry for ScreenSaverEngine, and click once to make it more visible, as seen in the image at right. As you watch, the CPU usage for the screen saver will jump around a bit, but you’ll get a good feel, in general, for how much of your CPU it’s using. If the screen saver is using a high percentage of your CPU, you may notice effects such as audio skipping, slow typing, and sluggish application switching. If that’s the case, your machine probably isn’t fast enough to run the screen saver while also being used in its normal fashion. Note: The following section is completely optional, and just makes it easier to use this trick in the future. Feel free to skip it if you don’t mind typing (or copying and pasting) whenever you want to demonstrate the screen saver on the desktop. It’s very important to note that the above should be one long line, with no added spaces at all, other than before -background. (I broke it into two lines for a narrower display here.) The first bit, the ssbg part, is the name of the command we’re creating. Feel free to change that to whatever you like, but keep it short (since you’ll have to type it in), and don’t put any spaces in the name.